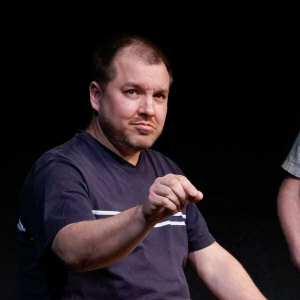 Joe Uchno happened upon improv by signing up for a class at the UCB Theatre in New York. While there, he was able to study with and be inspired by some really great teachers. Discovering WIT was the best part of his move to DC in 2005. Through taking classes at WIT, he was able to study with and be inspired by some really great teachers. Joe performs with ensemble Jackie. Previously, he performed with JINX. He has found that when he is not doing something improv-related, he misses it tremendously. Teaching improv, Joe has discovered, is way more fun than he thought it might be. While there, he was able to study with and be inspired by some really great teachers. Discovering WIT was the best part of his move to DC in 2005. Through taking classes at WIT, he was able to study with and be inspired by some really great teachers. Joe performs with ensemble Jackie. Previously, he performed with JINX. He has found that when he is not doing something improv-related, he misses it tremendously. Teaching improv, Joe has discovered, is way more fun than he thought it might be.